Public radio is at it’s best when it feels like a conversation: intimate, engaging and sometimes quite funny. This week our reporters focus on Oklahomans with stories to tell, in an informal, one-on-one setting. In recent years, the music industry has been diversified and democratized by technology. Smaller record labels are popping up all over the country, promoting local bands. Assignment: Radio ECU reporter Rankin Barger speaks with Mike McClure about his Ada-based, independent label, “598 Recordings”. Rankin Barger: How did 598 come about? and what not and he agreed to do that and he’s been very generous so far. Rankin Barger: How many band are you up to now on 598? independent records can stay afloat? know each other it’s just a similar wave of music coming along. Rankin Barger: Are we deeming Norman as the new spot? about the music, and that’s cool. the transition from the Great Divide into Mike McClure helped you and 598? Rankin Barger: Is your name holding the banner so far on 598? lot fuller and has more of a presence. He’s been a great part of that. always looking for something like that. Rankin Barger: So 598 is open for all music? rock ‘n’ roll a lot more but the times kind of dictated some of what I was doing back in the day. music and a good live show. Rankin Barger: Where do you see 598 in the next ten years? part that I get one hundred percent say so of, and as long as that done right it’s nothing but up. Rankin Barger: What’s the newest on the Mike McClure Band, new shows, new album? life; I don’t want the basic 9 to 5? 92. Then I got a gig acoustic were it was free beer and a couple hundred bucks for just playing. Ever since then it’s been no looking back. Tucked away in a corner office of Carnegie hall is Dr. Farland Stanley. He has a window on his door so students can always see if he is in. Those who know Stanley only as a professor may find it difficult to imagine him as anything else. But his life as a professor is in stark contrast to the life he had in his 20s when he was a rock and roll guitarist. From an early age Stanley knew he wanted to play the guitar. Dr. Stanley: I guess I was 15 and I ran into this love of playing music because my daddy had been a guitar player and he one day said 'I want to show you some things' and he taught me my first cords. And I went to Sears and Roebuck and bought a silver tone guitar for 27 dollars and I paid it out at 50 cents a week until I got it paid for...a nd my mom told me I couldn't go on the road until I was 18 at least. So I had my 18th birthday and one day… two days… seven days… and I got up the nerve and I asked her to go on the road. And at the age of 18 and one week I went to California to play rock and roll. Michael Fox: Who were some of the artists that you played with? Dr. Stanley: There was a fella named Billy Joe royal whom I really liked he had a very high voice very very good. And his hit song at the time was a song called Down in the Boondocks 'down in the boondocks.. Down the boondocks.... people put me down but that’s the side of town I was born in..' and you know it was an awful lot of fun. I remember leaving the road. And I was 30 years old and the last time I had seen anything to do with education outside of music was back in 1959 when I graduated from high school. So I came back and I wound up here at the University of Oklahoma as a freshman 30 years of age. Michael Fox: What was it that made you want to go back to school? Dr. Stanley: I wasn’t able to articulate it at the time but looking back and reflecting there was a certain emptiness that I found in my life intellectually. Music was wonderful, I still love it, but there was something that was lacking I have fallen in love with the whole process of learning. It’s been my life. I don’t want to retire. I just love what I am doing. Dr. Farland Stanley studied Classics and History at school. This set him up for a life as an archeologist; a life which has taken him all over the world. Including one of his first dig sites in Israel. Dr. Stanley: We started working at a side of Ceaseria Martina. And we had been looking to the material particularly paying attention to what the bible had to say about this place. And went and explored for a year or two looking for this temple that King Herod the great built. Well long story short after 5 years we found where it was and it took another 3 or 4 years to move the soil away. And discovered a building below ground that was the size of the Parthenon. Michael Fox: For the people whose idea of archeology is Indiana Jones? Would you mind explaining the difference between Hollywood and reality? Dr. Stanley: Well I would say that the first week that students go I would say every one of them felt this notion of Indiana jones the excitement. Boy this is so cool. Well in the first week, and probably in a couple of days, people realize whoa this is work. As a professor at OU Dr. Stanley has shared his passion for archeology and classics. This passion has evidently rubbed off on some of his students, because in 2007 Dr. Stanley won the Gussi World Peace Prize. The Gussi Peace Prize is an award given in the Philippines by Bary Gussi, an honorary ambassador of Marianas. It is an award not many in the US can boast. Dr. Stanley: Ambassador Gussi started looking at people from all different disciplines. Each year they would choose 10 people from varied disciplines like medicine, statesmanship, and in my case teaching and archeology. It is very strange how things work out. I had a student many years before. Which I found out later that he told ambassador gussi you need to talk to him. So um. Long story short he called me one night shocked the daylights out of me. Would you like to come down here we would like to meet you and hope you would consider accepting the Gussi Peace Prize. Michael Fox: Your life has gone through so many avenues. Guitarist, archeologist, professor. What have you found has been the most rewarding occupation for you? Dr. Stanley: Oh, it has to be the spiritual I think from teaching. There is nothing quite like it. As I am talking with you now. There is nothing quite like the connection between people that have a common interest. Someway that you want to enrich your life. When a professor loves her subject and teaching, the effect can be contagious. Assignment: Radio reporter Trauvello Stevenson speaks with one OU sociologist who enjoys when her roles in research and teaching inspire each other. Dr. Stephanie Burge is a sociology professor at the University of Oklahoma teaching classes that focus on gender, education, race, ethnicity and ageism. She has several published works that examines the characteristics that make up a person's social location. But what make her research special is the driving forces behind the topics she study, her students. Burge says that her students are what really influences her areas of study and motivates her research. But she fell in love with sociology a long time ago. Dr. Burge: "When I was an undergraduate at Florida State University, I took a class with Patricia Yancy Martin, who is a renowned scholar in the area of gender and that actually that course actually was the changing workplace and it was an honor's seminar and I really liked the professor. And she was fascinating to me and I felt like she was very dynamic and I thought the sociological perspective opened up my eyes to the world and so I took every class that Dr. Martin had to offer. And eventually I realized I wanted to a sociologist and she encouraged me to go to graduate school and I went to Florida State also to pursue a graduate degree in sociology and I studied with her and I studied with other professors as well and that helped me to realize I that I wanted to be in academic and to teach sociology. Trauvello Stevenson: "How would you say teaching or research has either inspired both for you as a person individually and as a teacher?" Dr. Burge: "I view research and teaching as very integrated and I don't view them as competitive with one another. I view them as informing one another so you know when I am in the classroom and I'm talking with my students about you know these issues that I'm studying because I tend to teach things that I also study. You know I hear ideas and perspectives from them that help inform how I am thinking about my own research. You know the sorts of issues I should be attending to, the approaches that I'm attending to, you know students may not be trained sociologists but they're smart, they're analytical and they're capable of evaluating you know whether this is a good study or not or limitations of a study. And that informs how approach my own research. At the same time when I am working on research or reading literature to inform my research bringing those things into the classroom really helps the students to be up to date on what’s out there in terms of this current state of the knowledge with a particular subject. So, I view them as not only integrated but really as important to one another and then teaching is such as enjoyable, I like my job in general but teaching is a really enjoyable part of my job for me because its really fun to see young minds turned on to being critical and analytical and you know synthesizing things that they are learning in your class with other class materials. I mean I saw that today you know a students say "well in another class I read Promises I can keep" and bringing that sort of information together...that’s exciting. Not just a professor but a scholar to see." Trauvello Stevenson: "I noticed that you have a really good rapport with your students. Well how do you achieve that?" Dr. Burge: "I view education and teaching as a reciprocal process. I don't view it as didactical. A didactic approach to teaching would be that I have the knowledge and I'm going to give you the knowledge and then you're gonna tell me back the knowledge in some sort of evaluation, you know like a test basically or a paper. I think its more iterative than that. I feel like students may not be sociologists but they have had a variety of life experiences, they have read a bunch of things, they've taken classes they're informed, they're consumers of information and so I think its very important to incorporate that into the classroom experience. And I also think you know a whole of educational studies show that if students relate to the material they learn it better. And the best way for students to relate to the material is see this applies to my life. And now, admittedly the subjects I teach, its not hard to do that, I mean, gender is in everyone's life. Aging is a function or something that happens to everyone. You know we cover issues of family and work, these are things students are naturally interested in. But I feel like the ability to converse about these things, its helps the students to flesh out their ideas. Helps me to think about these ideas more critically and it also really helps to create an environment where everyone can be heard and can be listened to and also to have something to say. In addition to her students Dr. Stephanie Burge now has a new driving force behind her research, her ten month old son. Burge says having a child has opened her eyes to new sociological areas of interests and she is currently doing research with a colleague that looks at how having children affect women in the workforce.In the spring she will be teaching several sociology courses at the University of Oklahoma. Cosimo Vestito is an exchange student from Italy, currently attending OU. He is also one of our Assignment: Radio reporters. He speaks with someone who helps other international students find their way at the University. Tina Henderson is the Exchange Student Adviser at the University of Oklahoma. For the past decade, she’s been handling all things concerning exchange students from all over the world, like registration and enrollment. The Study Abroad Office of OU is full of pictures, postcards, and souvenirs from all over the world, each of them a gift, a memory from international students, a sign of their love and gratitude. The University of Oklahoma hosted 283 students from 29 different countries last year. OU also sends American students to over 100 different cities in 50 different countries. Tina Henderson explains what it means being the “go to” person for all the exchange students. Tina Henderson: For an exchange student, if It is a Friday night and they have a horrible toothache, I know a dentist; students are having problems with housing, I am the person they need to talk to; students are having a problem in the class, it's my responsibility to contact the professor and talk to the professor, and maybe having them drop the class or maybe giving them an extra tutoring; I am also the person that you're homesick. I am a mother. I have a 20 year old son. I can’t say that I know what it feels like to have my son go abroad, but leaving home and going to the other side of the country was hard so I know what it feels like if students come here missing the comfort of home, missing your parents, girlfriend, boyfriend, anything like that. Cosimo Vestito: Caring about paperwork, hundreds of emails, requests of any sort can be very tedious and annoying. What keeps your motivation up? Tina Henderson: Getting those students here, I love the whole aspect. It is busy, it's busy job. It's busy for every adviser who works in our office with outgoing students just as much as the incoming. It is the aspect of getting the students abroad. We work really hard in our office to get students to go abroad, I work really hard to get then here because I'm proud of the university I'm proud of OU. What is really gratifying is halfway through the semester, when we get those students who have never left their hometown, they never want to leave OU. They come to me and say "You know what? I want to be a student here, how do I do that?" Cosimo Vestito: Why do you like being an exchange student adviser so much? Tina Henderson: I didn't start doing that, I worked in PR for a really really long time and it was a dead end job pretty much, so when I moved here in summer of 2001 with my husband and son, I took a little time off and decided I wanted to work in university setting. So, I came here to OU working as a temporary PEAK person (when you go from one job to another) and I got hired to work here in this office. It started in January 2002 and really that was my first cultural integration because I come from a very non-cultural based town, because it is very small and it is northern Maine. We had Canada and Maine and that was it for culture, coming is just opening my eyes and to think I could never go back to where I was before because now it just thought being able to change someone else's life for the better, to have them come here, to show them Oklahoma. Cosimo Vestito: One time I read on the Facebook page of the Exchange Student Program that one student told you're like an international mom for all of us. Do you really feel like an international mom? Tina Henderson: I do. I'm probably the mother figure for many students because I've had the crying students, I've had the laughing students and I just ... they can go and chat. And maybe they just need 5 minutes of calm or someone says it's going to be ok. I'm here for you to help you. I have been given that title. I know students on six continents now, I think I could probably travel anywhere in the world, send them a mass email and I would have a response from students who were here ten years ago. Cosimo Vestito: Your favorite quotation is "the world a book and those who do not travel read only a page”. Tina Henderson: You have to go abroad. You cannot live in the little world we call Oklahoma. To open your world up today you have to go abroad. Even student who live in a small little village that is only accessible.. to just you and your family, you have to reach out. It's 2012 and to be able to say you've been able go abroad see different culture is experience different life. That is what we want for all the student who's here in OU, we want the students to come here as well. You have to travel because it's just part of our world today. When asked what she likes the most about international students, Tina Henderson answers jokingly: "they bring me gifts", but then she adds" they're all different". Welcoming and looking after hundreds of students from all over the world has taught her the value of travelling, as a way to expand our horizons and relate to different people. "Dr. Boyd On Her Life and Science Fiction"
Dr. Katrina Boyd has spent most of her life watching just about every genre of movie. Her infatuation with cinema grew at a young age from pure enjoyment for entertainment, to academic and professional success by studying everything about movies: from the history of motion pictures, to how they are produced, to what they stand for culturally. Assignment: Radio’s Michael Rymer spoke with her about her passion for cinema. Dr. Boyd: Well, from an early age, I was…my family were avid moviegoers. We went every Friday night to the movies because…strangely enough, my parents were raised Nazarene and at that time in that religion they weren’t allowed to see movies. It’s changed now. But…so at that time they weren’t allowed to see movies and they didn’t watch any movies at all until they became Presbyterians. So once they started going to movies they became total fanatics and they went constantly. So I was introduced to the contemporary movies from going every Friday night, but meanwhile back at the house I’d be watching old movies on television and I was particularly fascinated by them since my parents didn’t know about them. And it was really things they should have known but since they grew up not watching movies at all, these movies from the 30s and 40s seem like these amazing mysterious artifacts that my parents have never heard of and so that made it that much more interesting. Michael Rymer: Ok. I noticed that you have been to Paris to teach. Dr. Boyd: Yes. So I actually went to France two different times. I went for a year when I was seventeen and did a year of high school, lycée, and then when I was in graduate school, I wanted to take film classes in Paris, so in order to be able to afford to do that I applied for a scholarship that I won to teach English in France. So I taught English at the University of Paris Dix, that’s Paris Ten, in Notaire, that’s outside of Paris. And I lived in Paris for a year and took film courses including with Christian Matts, who is a very very famous film theorist. And it was a great experience. But teaching in France was a real challenge. Luckily I’d been there when I was in…going to French high school. So I was aware of…there’s a very adversarial relationship between teachers and students in France. It’s like this…it’s kind of an education based on humiliation. So there’s this very odd…so like when I was in French high school, it would take an hour to get things handed back. Like the teacher would be handing the papers back and it would be like, “Rafael, you did so well here in your essay on Napoleon…and then you said this. What were you thinking? Why would you do that?” So luckily I had witnessed that so that I…so when I was teaching at the college level, I could understand why the students were so surly and difficult and just basic maintenance of the classroom was very…a challenge. Katrina Boyd returned to the US in 1991 and started teaching at the University of Oklahoma in 2005. She’s currently working on a book that expands on themes outlined in her Ph.D dissertation. Dr. Boyd: There’s a term called cognitive estrangement, and this idea that Science Fiction is a genre of cognitive estrangement. So it takes things that we’re familiar with in our daily lives and estranges them by putting it in a…now it’s on a different planet; or it’s not racial groups that we already know about. So it makes it… gives it a fresh spin so that we can look at it in a new fresh way. So, obviously a lot of people talk about that. But then the problem is then they want to not talk about the entertainment aspect. They just want to say, ok it’s estrangement. We’re going to ignore all these other things. And we’re going to say…some films...there’s literally a term, “para-science fiction”, where people say that things like Star Wars are not Science Fiction because they’re entertainment and they’re not doing these other things. In my view it does make a lot of sense to define a genre in a way that rules out what one hundred percent of people except for academics would consider to be that genre. So might as well define the genre in a way that accounts for what we already call Science Fiction. So basically I’m trying to deal with this intersection of thinking about utopian and dystopian themes and Science Fiction entertainment…the entertainment aspect in terms of its utopian appeal and those overlap in interesting ways. Dr. Katrina Boyd says an official release date for her book, The Shock of the Now: Science Fiction, Entertainment and Cultural Critique, hasn’t been set, but she hopes it’s ready for publishing very soon. For five days each year, the deadCENTER film festival screens nearly 100 movies at several locations throughout Oklahoma City. Filmmaker Lance McDaniel became the Executive Director of the event in 2010, and that same year Moviemaker Magazine named it one of the “Top 20 Coolest Festivals” in the country. Paige Willett spoke with Lance McDaniel to find out what makes deadCENTER so unique. Lance McDaniel: From the very first what I loved about it was that it was completely focused on the needs of the filmmaker. All the films are celebrated. So, we show about 100 movies a year, and some of those are from Oscar winning directors, and some of those are from high school students, you know, from Moore, Oklahoma. And so, what deadCENTER does better than any place I’ve ever been is create an environment where those people can interact together and kind of share their experiences. So, we’re not necessarily treating the famous filmmakers any better than we’re treating the new filmmakers. We’re saying, “This is to celebrate to every filmmaker, and every actor, and every crew member.” And so I think that what makes us cooler than a lot of festivals is that you are going to have an amazing experience no matter what level you’re at within your own career. Paige Willett: Reading up on you a little bit, I saw that you have worked in New York. You’ve worked in London. You’ve worked in LA. You’ve kind of moved all over the, kind of all over the world. And it seems like you really have a passion for Oklahoma. So, why did you bring yourself back here to work on film specifically? Lance McDaniel: I feel like Oklahoma is exactly where I should be, and the creativity going on here, it’s certainly from big people like the Flaming Lips to the small bands at ACM. I mean that the fact is that there is so much creativity going on here that you feel like you can be a part of. Certainly London has great creative things on, but I don’t think all 10 million people feel like they’re a part of it. Whereas, here in Oklahoma, if you just, if you’re willing to volunteer you can be a part of the creative renaissance going on here. So I find that very, very exciting and rewarding. Paige Willett: deadCENTER board member Peter Dolese said your “passion for the art of filmmaking is unparalleled.” Why film? What really draws you to the art of filmmaking itself? Lance McDaniel: I’ve worked on 13 feature films, 11 here in Oklahoma, and just the process of getting 70 people to come together, to work together, towards an ultimate goal of creating this visual, you know, this visually driven piece of art, I find fascinating. As a kid, I was very, very intrigued by film, and I was drawn in to it emotionally. And I felt like more than the other arts for me personally, it had the ability to really kind of sear down into your soul, and it also had the ability to communicate truth on a wider spectrum because if you make a good film, it goes all around the world. Paige Willett: You spoke about being really intrigued by film since you were little. So, who really was instrumental in getting you involved in film when you were younger, and kind of setting you on the path to set you up where you are now? Lance McDaniel: I was more inspired by just the movies I saw than the fact that I had access to equipment to make my own movies. I just, we have a… well, I saw Star Wars at the drive-in in Alva, and that was just probably just the most exciting thing I’d ever seen in my life. My grandma actually took me. And she loved it, and I loved it. And I had just never seen a world that different and that unique. And in to junior high and high school, I started looking at more films; films that I felt like were more personal to me. I went to Stanford for college, and I went there, and I was a film major. Once I started taking film theory classes, I think probably the one that inspired me the most in college was “My Own Private Idaho” which was one of Gus Van Sant early movies with Keanu Reeves and River Phoenix. And that was the movie that I decide I would make movies for a living. Paige Willett: You spoke about working of films that are really important to you or seeing films that really kind of touched you. Earlier you were speaking about your passion for Oklahoma as well, and I noticed that you have worked on a movie recently that just came out called “Pearl” which I think is really exciting for Oklahoma. So, can you just tell us about that experience working on “Pearl” and kind of what it’s about? Lance McDaniel: “Pearl” is the first film made by the Chickasaw Nation. It is about a woman named Pearl Carter Scott who was the youngest licensed pilot in history. And she was 13. She was a 13 year old Chickasaw, half-Chickasaw girl living in Marlow, Oklahoma in the late 20s. And she flew, basically Wiley Post inspired her to fly. Working on that movie was probably the best experience I’ve ever had on a movie, and part of it was it was the first G-Rated movie I had worked on. And so after working on a number of scary movies, and so all of us went from doing all these night time movies to pouring ourselves into this daytime kid movie, and it was just pure joy. Paige Willett: Pearl” had an almost entirely Oklahoma cast and crew. There are other films like that that you’ve show at deadCENTER like “The Rock ’n’ Roll Dreams of Duncan Christopher.” Why do you think that that’s important and how has that affect the Oklahoma film industry? Lance McDaniel: “I think having all these home grown films is critical because then you’re going to be getting more Oklahoma voices. Even if you’re not, even if each film isn’t some like perfect capsule of what you’re trying to express, it is teaching local filmmakers how to communicate themselves, or how to communicate within film. I randomly, I just ran into Sterlin Harjo across the street at lunch. Sterlin Harjo is an OU graduate who has won awards at Sundance. He’s done “Four Sheets to the Wind,” “Barking Water.” He is probably one of two of the most successful filmmakers from Oklahoma, Sterlin Harjo and then Brad Beesley, who did “Okie Noodling” and “Sweethearts of the Prison Rodeo.” Those two guys have done an amazing job of telling unique Oklahoma stories in a way that gets national attention. What I like about the films like “Duncan Christopher,” like “Rainbow Around the Sun,” like “Love Town,” is they’re telling our stories. Filmmaker and Executive Director of deadCENTER Film Festival Lance McDaniel continues to tell his Oklahoma stories. Last summer he filmed a comedy with Saturday Night Live star Chris Kattan. “Just Crazy Enough” which was shot entirely in Oklahoma; he hopes it will be released on DVD next spring. "Extreme Extracirricular Activities: Storm Chaser"
Some people (like Lance McDaniel) see a film like Star Wars and decide to devote their lives to filmmaking. Assignment: Radio’s Jessica Wilder discovers how one OU student was inspired by the movie The Wizard of Oz to enter a slightly more dangerous career. 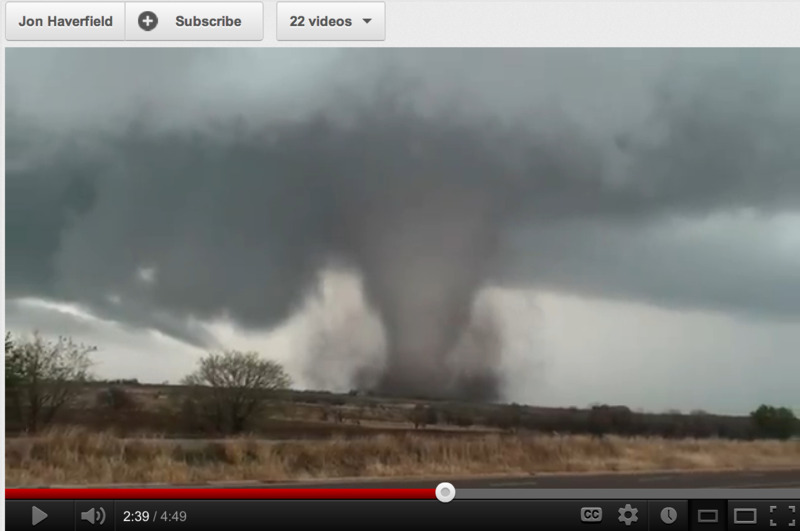 Jon Haverfield is a professional "Storm Chaser" at just the age of 21. As a meteorology student, Jon has excelled in his field by not only working for local stations but by sending footage of the storms he chased to national stations as well. Jon has quite the resume in meteorology and it didn't just start when he hit college. Jon has had an obsession with all things weather since a very early age. Jon Haverfield: I remember watching 'The Wizard of Oz' when I was like, 3 years old and it had that tornado in the beginning. I was like, 'Oh wow that's pretty cool' and I think from then on I just started watching documentaries on tornados. I actually had like, cut out pictures of tornados in my room, taped on the wall. So it was kind of a weird fascination, but it grew into a a passion for weather." Jessica Wilder: Do you remember your first severe storm that you chased? Jon Haverfield: The first successful chase, I would say, would be my Freshman year in college when I was able to chase with some other meteorology kids out in the Texas panhandle. We actually saw a few tornados and one of them came really, really close to us (about 200 yards away) and we kind of felt the shaking of the ground and the rumble of the tornado. That was my first, craziest moment of storm chasing." Jessica Wilder: Are the scary situations your favorite? Jon Haverfield: I'm kind of in it for the knowledge and getting more scientific knowledge for it, and also the big part of it is just warning people so I'd say just kind of the excitement and the thrill comes from, you know, just a side part of it. It just comes with the job, so to speak. I would say there's not a particular storm that I like. I mean, I definitely love tornados, but I mean like anything from squall lines to high wind events to hurricanes to even snowstorms. We've been out "snow chasing" and "ice chasing" anything that's really extreme weather, so to speak, really is a lot of fun to me. Jessica Wilder: Have you gotten into any dangerous moments? Jon Haverfield: Oh yeah, I would say quite a few, I mean there's definitely a dangerous element to storm chasing but it's really not as dangerous as what some people think it is. I mean, if you know what you're doing, you can kind of avoid the dangerous areas if you know what part of the storm you're at and where it's going." Jessica Wilder: ...and you've had a team that you go out with, and they're all meteorology students, but have you gone out with some professional news stations, and how was that? Jon Haverfield: Yeah, it's usually just me and my "Storm Team". That's what we like to call ourselves, just some meteorology students who share the same passion as me. We go out and chase whenever there's storms in the area and hopefully we don't have class during that time. There have actually been several times when I've had finals the next morning of huge chase days, which is very inconvenient. But there's actually a couple times where I actually went out with some reporters, some ABC reporters. One in particular Mike Boettcher who is an ABC war correspondent and also a professor at OU. We went out with him and he was kind of helping ABC and national do coverage of this pretty big storm event that was going on last April. We showed him a pretty good time! We saw about 10 tornadoes that day, and all of them right in front of us. Also, we saw dual tornados that same day (two tornadoes side by side) which was kind of a rare phenomenon. Jon currently works for Channel 8 in Tulsa and he hopes to get a full time job there upon graduation. If you'd like to join in on the conversation, please send in your comments.